Slides are similar to Google Slides but with Plus feature. The plus feature comes from the Slide Apps. To understand what Slide Apps can do for your lesson, read them here. Deck.Toys Slides allow you to embed the followings for your materials to support your multiple choice question or note. To set up the multiple choice question, you may insert a minimum of two answer choices. Click on the green tick icon to select the correct answer. When the student submits the answer, a green tab will appear for a correct answer, and a red tab to indicate that the answer provided is wrong. For the wrong answer, the correct answer will automatically be shown to the student. To activate the Slide Apps, click on the 'Add Slide Apps' red icon on the top right side of your slide. 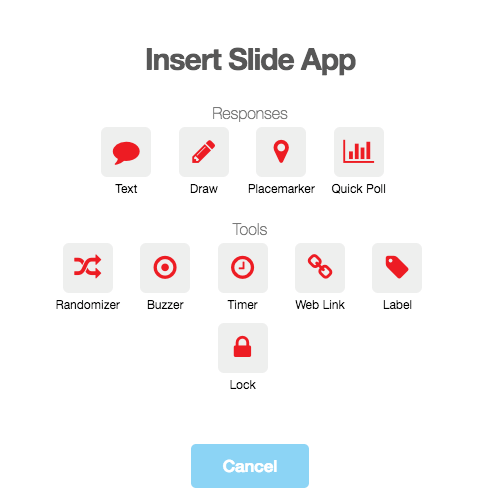 There are ten Slide Apps which you may choose from to use in your Slide. To select, click on the icon that you are interested and it will be added to your Slide. Slide Apps can be placed at three different location on the Slides; side of the Slide, inside the text, on video/ slide image. Use the drag-and-drop motion to position the app on video/ slide image and inside the text field.